It is dry and comfortable beneath the boom tent when I wake up at dawn. The breeze has been blowing through the vent up forward and there is not a hint of moisture in the boat. I undo the rear corner of the tent and look out over Cod Harbor to see that I did not drag anchor in the storm. I go over my options as I tuck away the sleeping gear. Saxis? Maybe Onancock? 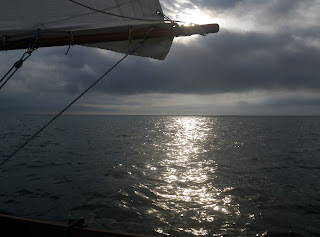 The sky darkens, I hear thunder to the SW. As I sail off anchor rain begins to fall. Enough is enough. Time to head home. With the SE breeze I could be back at the ramp late morning. 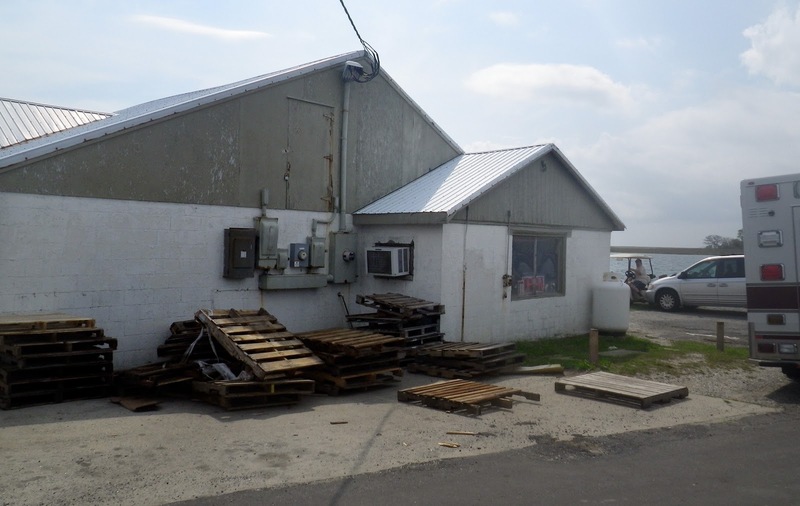 I set the gps for Crisfield. 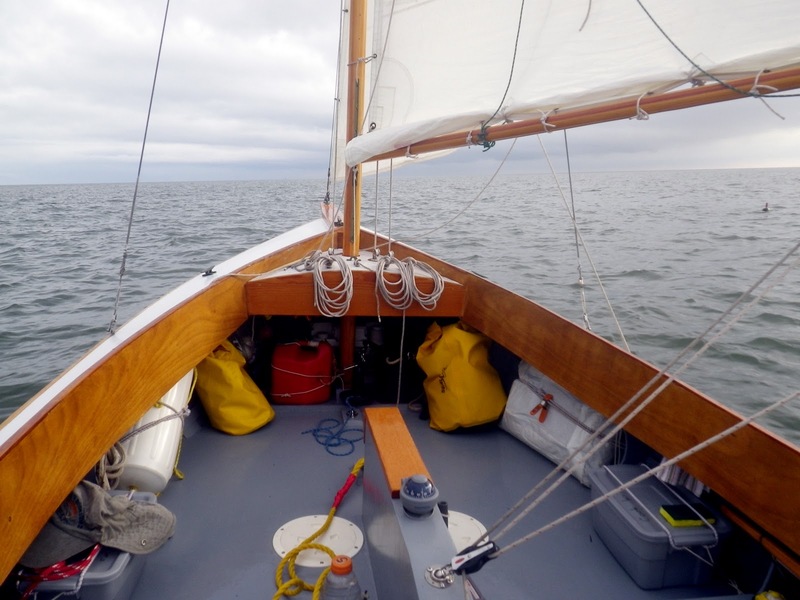 I leave Cod Harbor under mizzen and jib, raise the reefed main south of Port Isobel. A few miles NE of Tangier the skies clear and the wind swings to the NW. Blue skies and a nice breeze, I feel much better. Maybe those thunderstorms will be scattered, maybe the skies will stay clear. Glancing on the chart I see that I could have a nice run to Saxis. 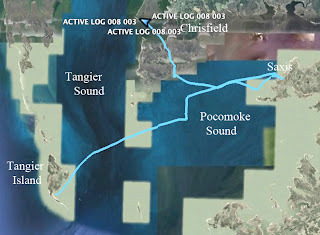 I reset the gps, turn east towards Pocomoke Sound. 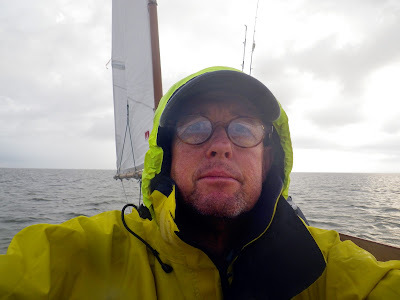 I strip off the foul weather gear. I look at my speed - five to six knots - and check the charts. I could be in Saxis by lunchtime. The wind falls off, I motor. The wind picks up, then falls off again. And then fills in for the last stretch past Long Point and Drum Bay. I can see the fish houses and shedding tanks along the waterfront. There are fish traps out near the entrance channel. I drop the sails and motor into the wind. The docks along the waterfront are all connected to fish houses, no place for a little sailboat. On the backside of the village is a small marina where I tie up next to the ramp. A local fisherman tells me Spartina will be fine there. He gives me directions to the restaurant - down past the shedding tanks, past the oyster house, turn left into the alley, cinderblock building. I find the building. There is no name on it, just a small neon "open" sign glows in the window. A woman walks around the corner and goes in through a plain wooden door. I follow her. As I open the door and step inside all conversation stops. Everyone looks at me. A waterman sitting at a table turns his chair to face me. He says nothing, just stares at me. "Can I help you?" a woman asks me. "This is a restaurant, isn't it?" I say, wondering if I walked into the wrong place. It is a restaurant, just not the Marshtump Cafe that I had expected. That was the name of the place about a decade ago. Now it is Martha's Kitchen and that is Martha asking me what I needed. I look at the menu. Sandwiches are a dollar or two, cokes are in the fridge. French fries are cooked in a little countertop fryer. It is more like a home kitchen than a restaurant. I order the club sandwich for $2.80. White bread, some ham, cheese and I think she warmed it up in a microwave. Sitting in the plywood booth I can hear people talking about me. The waterman sits at a table and swat at flies. I eat quickly and pay my tab. I walk through Saxis. 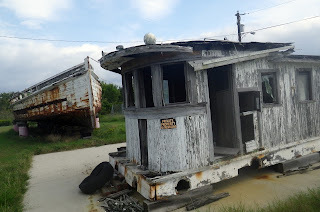 There is an old bait shop by the pier. A sign in a yard advertises decoys for sale in a small shop. I look in the shop and see carving tools and five or six cats perched on the table and chairs. Down the road shedding tanks are full of crabs, two men sit in the shade near a building. Mounds of oyster shells line the road. 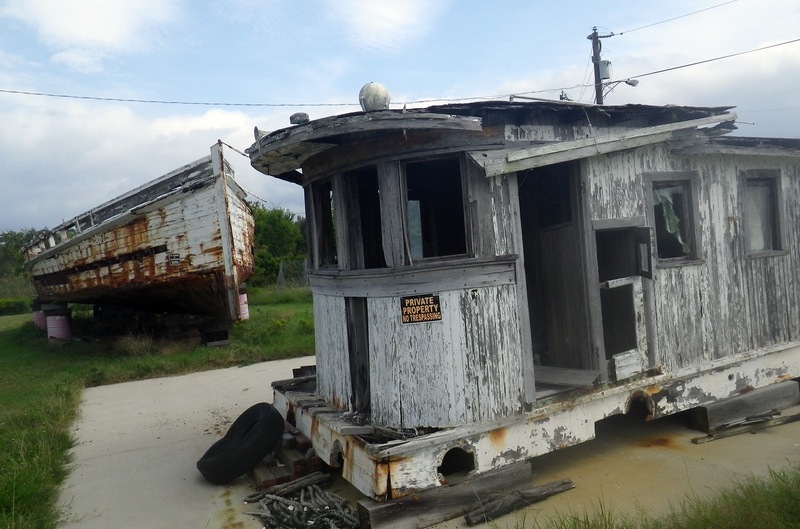 An old buy boat, the wheelhouse removed from the hull, sits in a field. 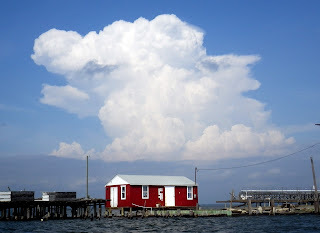 I'm back on the water by 1:30, a thunderstorm towering in the distance. 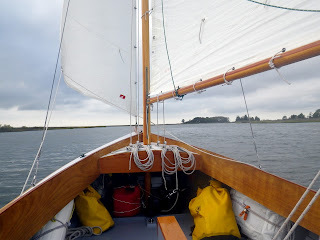 The southwest wind carries me back past Drum Bay and Long Point. I set my course for Great Fox Island. The wind falls off and I motor sail west. The wind comes and goes as I cross Pocomoke Sound. On the horizon I can see the house on Great Fox Island to the west. I turn north just as the SW wind fills in, heading towards the mouth of Broad Creek. 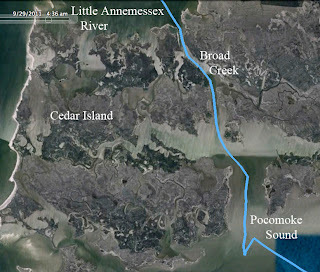 The creek runs behind Cedar Island, connecting Pocomoke Sound to the Little Annemessex River. The southern end of the Creek is wide and well marked. 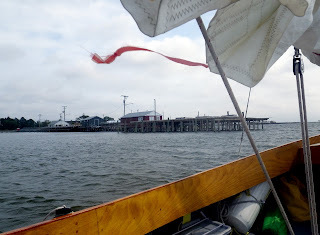 I run downwind past the green markers, past a small island with a pier and a small house tucked away in the trees. To port is a nice protected cove and I think that I might want to anchor there someday. The creek narrows and the markers disappear. 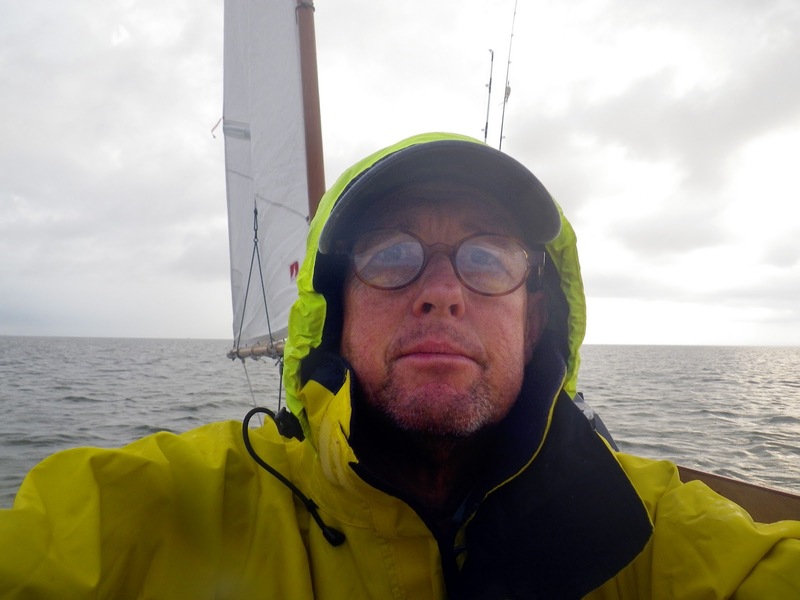 I follow the main channel, now sailing wing and wing at four and a half knots. It is beautiful sailing with marsh and trees on either side. The channel branches off in a couple of places and I worry that I have left the creek. We sail through a stand of tall trees, the channel opens up and I see the river up ahead. We sail NNW across the Annemessex River. Crisfield is to the NE, Tangier Sound is to the west. I don't need the gps to find Old House Cove, I can easily see the brick chimney that sits out on the sand spit and marks the entrance. A little before 5 p.m. I sail into the cove, turning west to anchor behind a line of pretty dunes. A light dinner of crackers, anchovies and a cup of fruit. I fill out my notebook and notice lightning to the south and northwest. I check the weather forecast which tells me there is a chance of showers and thunderstorms overnight and again tomorrow. I set up the boom tent. The anchovies and crackers may have been more satisfying than the tepid 'club sandwich' that you had in that restaurant! I look forward to your sailing adventures. There are so many people with boats who do not get to enjoy them the way that you do. 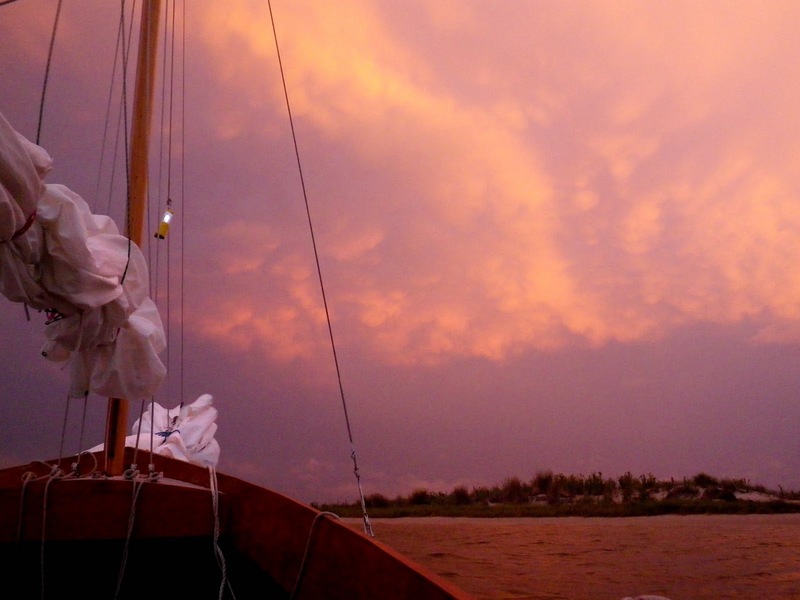 My question is: I worry a lot about thunderstorms and especially lightning when I'm out on my boat. Do you have steps or precautions that you take when thunderstorms are threatening? Who will give me a bid?